Ronan Cox (@ronancox2) - Business Librarian, Dublin City University. The above quotation (Hillenbrand, 2005 cited in Kelly, 2010, p. 164) is one heard in the past, yet it seems ever more important in the present. 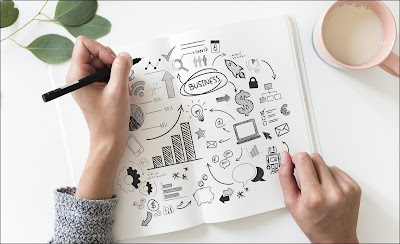 I noticed recently that Kristin Meyer, User Experience Librarian at Grand State Valley University in Michigan is hosting a workshop ‘From Insight to action with Appreciative Inquiry’ at the 2019 UXLIBS conference. Such an event serves to highlight the dual function that appreciative inquiry can play, examining library operations at a wider strategic level while also focusing on improving customer experience. Having attended both the Consortium of National and University Libraries (CONUL) and Dublin Business School (DBS) Library Seminars last year, the words of two speakers continue to resonate. John Cox, University Librarian at National University of Ireland Galway spoke very convincingly at both seminars about the need for strategic transformation within academic libraries in order to position themselves centrally within the institution. Marie O’Neill, Head Librarian at Dublin Business School at the time, delivered the opening presentation at the DBS Library Seminar, speaking passionately about the importance for all libraries in writing a strategic plan and strategizing generally. Different, yet intrinsically linked. The common theme? Strategic thinking and the need to reframe our identity both as libraries and as librarians in order to remain relevant. This might seem overly negative or unnecessary scaremongering, yet this is not the intent. In fact, my approach is to frame this situation in an entirely positive way by applying the concept of appreciative inquiry. In the role of a business librarian within a university context, perhaps the default method of thinking is invariably from a business perspective. Similar to any business, the operating environment for academic libraries is constantly shifting. A necessary consequence: be very clear about strategy, strategic positioning and alignment to the environment. Cox (2018a) addresses this point extremely well in his literature review on the matter of positioning the library within the institution. The higher education landscape exists in a constricted marketplace with several competitors, both domestically and internationally. With this comes greater accountability, stronger competition, higher student expectations and the need for competitive differentiation. Operating in this environment, libraries are answerable to several key stakeholders. These include, but are not limited to; government bodies tasked with the delivery of national education mandates, the board of management at respective universities, local, national and international peers, and members of the public. Additionally, rapid technological developments, changes in the area of scholarly communication, data management and pedagogy are forcing libraries to develop new resources and service areas (Saunders, 2015, p. 285). Once formed, the perspective on the current environment generates the obvious question. How do libraries and librarians react strategically? There is certainly a large volume of literature available on various strategic approaches. Murray and Ireland (2018) provide a very interesting examination of provost’s perceptions of academic library value; it is certainly worth a read. In general rather than library specific terms, I ask you to consider the example proposed by Reeves, Haanaes and Sinha (2015). They illustrated the idea of a strategy palette consisting of three dimensions: predictability (can we predict and plan it? ), malleability (can we shape it?) and harshness (can we survive it?). 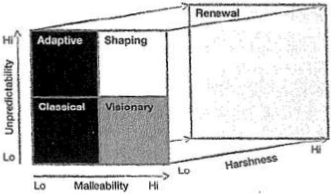 The resulting five environments (adaptive, shaping, visionary, classical and renewal) differentiate the strategy required for each (see figure. 1). It is possible to provide a strong argument that for the last decade, the prevailing dimension for academic libraries has been one of harshness with an accompanying renewal strategic environment. This argument is based upon my own experience, having worked in a previous academic library role during the years 2011 – 2017 when the full effects of the recession in Ireland were apparent, in addition to attending various external library committees during this time. 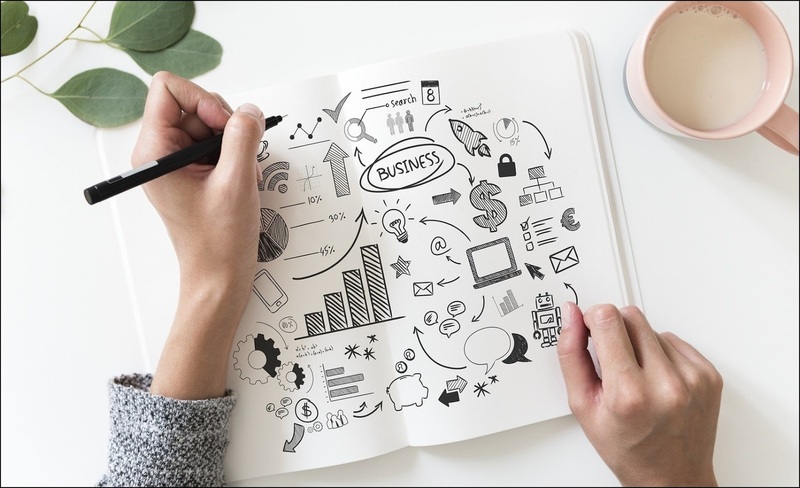 Under a renewal environment, an organisation must recognise and react to the deteriorating environment, act decisively to restore its viability – economising by refocusing, cutting costs and freeing up resources to fund the next part of the journey. ‘Shapers focus beyond the boundaries of their own organisation, often by rallying a formidable ecosystem of customers, suppliers, and/or champions to their cause by defining attractive new markets, standards, technology platforms, and business practices. They propagate these through marketing, lobbying, and savvy partnerships. Like a shaping strategist, the visionary considers the environment not as a given but as something that can be moulded to advantage. Visionary strategists must have the courage to stay the course and the will to commit the necessary resources’ (Reeves, Love and Tillmans, 2012). What is our purpose for being? Goals are how the library intends to achieve identified priorities. Of paramount importance, alignment with the overall goals of the university. Library goals simply cannot exist in isolation. As O’Neill puts it, ‘I would contest that libraries should be equal partners and influencers in the formulation of institutional goals’. Collins and Porras (1996, p. 69), argue that while an organisation might achieve a goal or complete a strategy, they cannot fulfil a purpose; like a guiding star it is forever pursued but never reached. The fact that purpose can never be fully realised ensures that the best organisations never stop stimulating change and progress. Give the innovative environment in which academic libraries operate, I believe they are unique positioned to take advantage of this. A well-written strategic plan should contain risk, innovation, originality and have transformative impact. O’Neill (2018) raises the point about using tools such as strengths, weaknesses, opportunities, threats (SWOT) analysis or political, economic, social, technological, legal, environmental (PESTLE) analysis in order to facilitate strategic planning. While I have used both of these tools in the past and recognise their practicality, there is potential danger hidden within. There is a risk of ‘normative isomorphism’, described as a tendency to replicate the plans of others, to look as others look and to approach problems in the same way (Maplas, 2015, cited in Dole, Dabbour & Kott, 2017). Secondly, the use of the SWOT analysis in particular tend to emphasise problems and shortcomings rather than accentuating the positive. I argue that now is the time to shape the future of academic libraries by adopting visionary traits in order to gain an advantage and seek competitive differentiation. Instead of focusing on what is wrong, libraries and librarians should be encouraged to envision a preferred future without constraint.